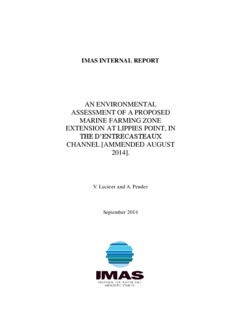 An environmental assessment of a proposed marine farming zone extension at Lippies Point, in the D’Entrecasteaux Channel, was conducted in February 2014. Following discussions between the Industry and the Marine Farm Planning division, an amendment to the initial proposal was considered. The amendment is detailed in this report. The area of the site covered 4.11 km2 (411 ha) and was orientated in a north easterly direction perpendicular to the coastline. The benthic habitats within the zone assessment area comprised of sand (60.8 %) and silty sand (39.2 %). Environmental data on substrate type, habitat distribution, bathymetry, and benthic flora and fauna were assessed. Within the proposed zone the substrate was characterized by sand and silty sand. The bathymetry ranged from 34 m to 49 m and was characterized by a channel to the northern end of the site. The resolution of the bathymetry in this report varies due to the amended section of the proposed region to the north being mapped with single beam acoustics and the southern end being mapped with multibeam acoustics. The amended zone to the north of the site was dominated by silt. Live and dead New Zealand screwshells (Maoriculpus roseus) were found across the whole survey site. Brittle stars (Amphiura sp. ), a heart urchin (Echinocardium cordatum) and Polychaete worms were common in all the sediment samples. The native screwshell, Gazameda gunii, was not observed in any of the sediment grabs. All of the sediment samples were odourless. The video surveys reported on in this report are for the amended region to the north of the proposed region. For details on the substrate in the southern end of the region, please refer to the report by Lucieer and Pender 2014. The majority of the amended site was characterised by rippled silty sand with high degrees of bioturbation, New Zealand screwshells (Maoricolpus roseus) sponge fragments and shell grit. The video data highlighted a large number of sites hosting squat lobsters, both live and dead New Zealand screwshells (Maoriculpus roseus) and drift algae (Ecklonia radiata and Phyllospora comosa). On video transect 5 a heart urchin (potentially Echinocardium cordatum) was noted.